The recent shifting of industrial capitalism in western societies has blurred the definition of work itself and its place in society. From the 70’s on, these changes have led, in the fields of human and social sciences, to an extension consisting in calling work a growing number of activities which used to be qualified as generosity, sharing, solidarity, gift, pleasure, creation or commitment. 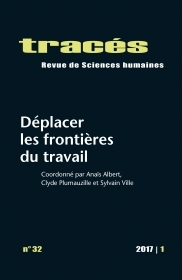 At this time of historical rethinking of employed labour and of its integrative capacity in society, of growing unemployment and of general merchandizing of human activity, this issue of Tracés Magazine wishes to follow this movement of denaturalization of work by appreciating the classification struggles which regularly renegotiate its boundaries. The term “boundaries” is essential. Seen as moving contact areas, it allows to overcome the commodification of activities and to focus on the plasticity of works and its boundaries. If each of the contributions of this issue sheds a light on our conundrum, all of them support a same vision: restore a positive view of the moving frontiers of work activities in close link with social practices, to seize as it is the work category in action, to achieve recognition of individuals and of their commitment to society. Organic farming: an occupation like no others? Is digital labour the end of labour or its infinite expansion?